The passing of a beloved member of your organization requires acknowledgement. Display a symbol of your loss to honor them and their contributions. There are many ways to show mourning and to honor the deceased. Similar to the traditional black dress at a funeral, many organizations also chose to display mourning more publicly. The United States even has Mourning Protocol where it talks about how to show mourning on a building or in place of flags at half-staff. One of the most common ways to show mourning is with a mourning bunting. American flags traditionally fly at half-staff as a symbol of mourning, but there are circumstances where this is is not appropriate or feasible. Attaching black mourning ribbons or streamers above a flag is an alternate mode of expressing mourning. 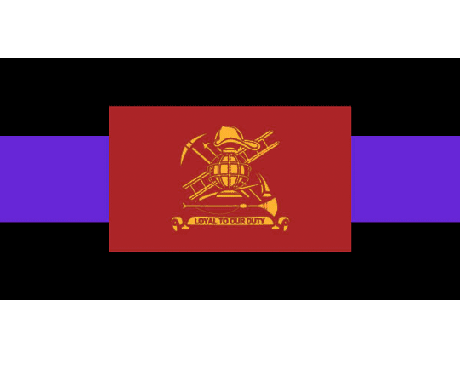 To display a flag with a mourning ribbon properly, a ribbon twice the flag length and no more than 10% the flag width should be tied in a bow above the flag and below the finial. 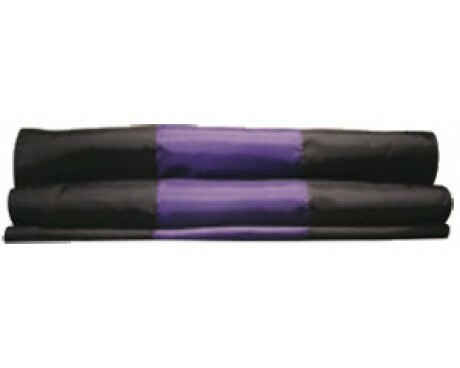 The two resulting streamers correspond roughly to the flag length. Gettysburg Flag Works offers a range of high-quality mourning buntings for display on your building or grounds. 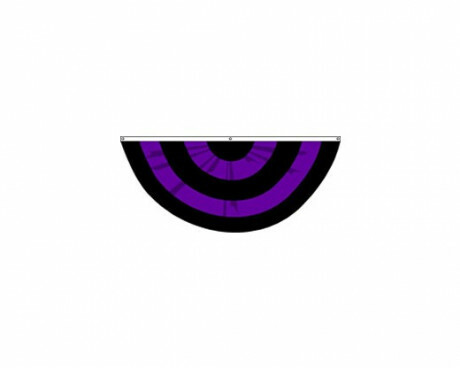 Traditional purple and black mourning bunting is available in pleated fans, half fan mourning buntings, pull-down buntings and in nylon rolls of purple and black bunting cut to length. 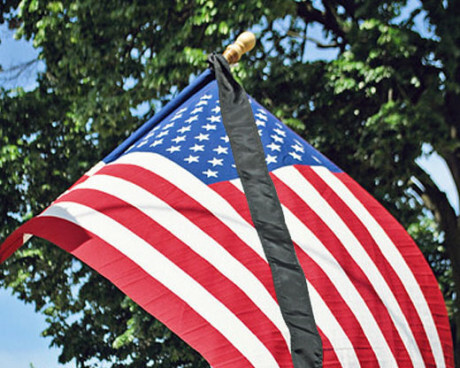 Each fire department or police department can have their own set of mourning traditions, but there are some common ones that we can talk about in regards to flags and mourning bunting. For many departments, it is traditional to hang purple and/or black bunting on the building, often over doorways and signs to show mourning. Fire trucks in funeral procession are often adorned by a mourning bunting, and the lights are typically shrouded with black bunting. 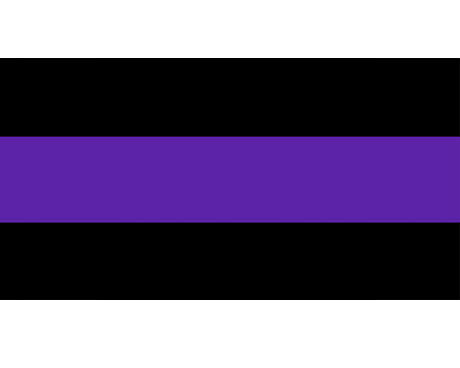 A police officer's shield or the fireman's patch is often covered with a strip of black to show the world that they are in mourning. 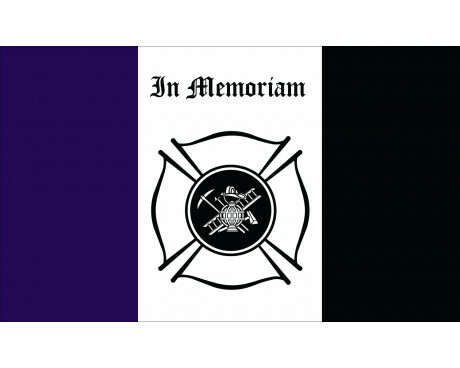 Mourning flags can also be used to honor police and fire fighters who have passed away. 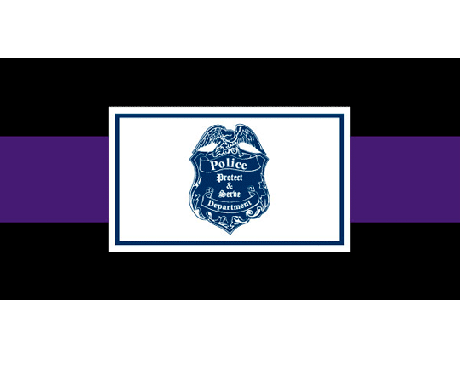 These mourning flags feature purple and black sections with the police or fire department logo in the center. 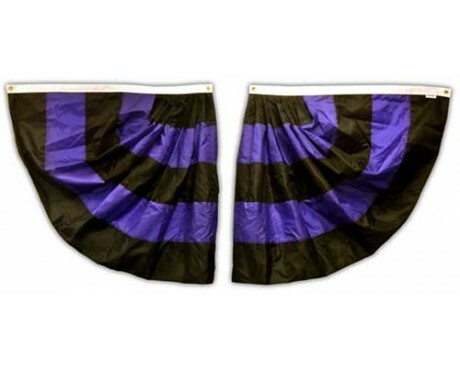 To solve the problem of what to drape a fireman or police officer's casket with when they haven't served in the military, Gettysburg Flag Works has designed casket drapes using our mourning bunting. 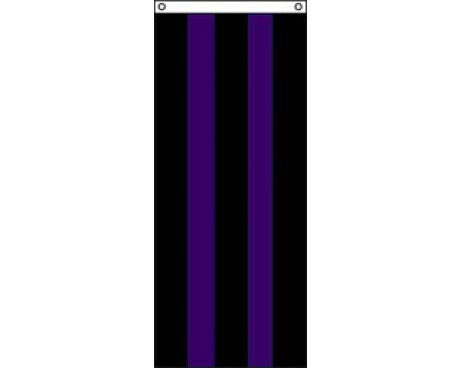 For funeral purposes, we've come up with a casket drape featuring purple and black bunting, and either the department flag or one of our stock flags. 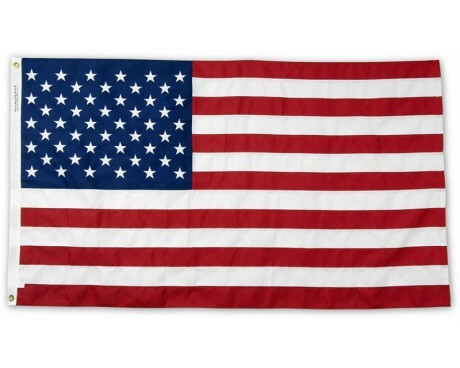 It is made in the 5x9.5' size of a typical American flag that would be used at a soldier's funeral. At Gettysburg Flag Works, we take pride in helping police and fire departments show their respect for fallen heroes. Our mourning ribbons, buntings, and flags are a great way to respectfully honor police officers, fire fighters, and others who have made the ultimate sacrifice. Interested in ordering a mourning ribbon, bunting or flag? Give us a call at 1-888-697-3524 or order online today! Have questions about morning ribbons, buntings and flags? Wondering how best to show your respect? You can learn more about proper mourning protocol here, or get in touch with our flag experts today! Call us at 1-888-697-3524 or contact us online and we'd be happy to assist you. Looking for other ways to show your respect for fallen police and fire fighters? Browse our selection of firemen grave markers and police grave markers.